Running a day late because of a last-minute countdown glitch, an upgraded SpaceX Falcon 9 rocket, a booster NASA is counting on to eventually launch astronauts to the space station, roared to life and shot away from the Kennedy Space Center on its maiden flight Friday carrying Bangladesh's first communications satellite into space. The booster's first stage, sporting redesigned landing legs, improved heat shield insulation, upgraded avionics and more powerful engines with crack-resistant turbine hardware, flipped around moments after falling away from the Falcon 9's second stage and flew itself back to an on-target landing on an offshore droneship. It was the 25th successful booster recovery overall for SpaceX and the fifth so far this year, the latest demonstration of SpaceX's maturing ability to bring orbit-class rockets back to Earth to fly again in the company's drive to dramatically lower launch costs. SpaceX founder Elon Musk told reporters in a Thursday conference call the "block 5" version of the Falcon 9 will take reusability to new heights. Each block 5 rocket is designed to fly at least 10 times with no refurbishment at all between flights and even more missions with "moderate" servicing after 10 launchings. A single rocket, he said, should be good for a hundred missions or more if the program lasted that long. "Our goal, just to give you a sense of how reusable we think the (block 5) design will be, we intend to demonstrate two orbital launches of the same flight vehicle within 24 hours no later than next year," Musk said. "That will be truly remarkable, to launch an orbit-class rocket twice in one day." The block 5 is the last major iteration of the Falcon 9, and Musk said he expects some 300 flights, using 50 to 60 boosters, between now and when the rocket is retired in favor of SpaceX's gargantuan "BFR" rocket, a launch system he says will one day carry people to Mars. 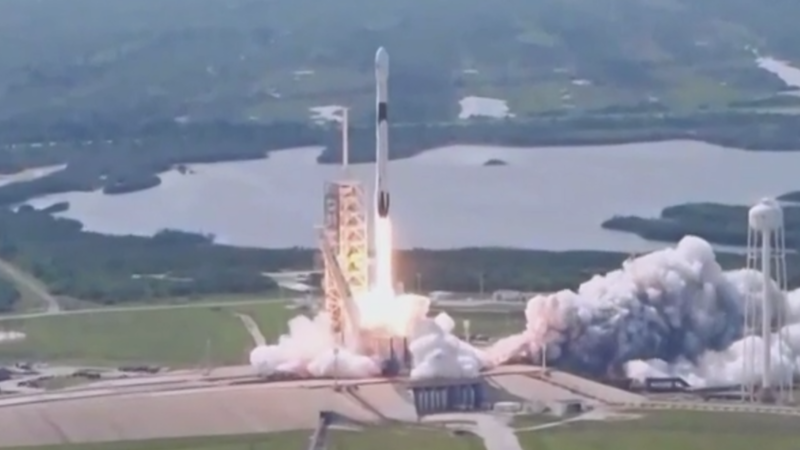 But in the near term, the company's major goal is launching its customers' satellites while demonstrating the block 5's safety and reliability, proving to NASA and the Air Force that the upgraded Falcon 9 meets stringent government safety requirements for both astronauts and high-value national security payloads. Seven successful flights are required before NASA will allow astronauts to luanch aboard a Falcon 9. SpaceX plans to launch an unpiloted Dragon crew ship aboard a block 5 Falcon 9 late this summer, with a piloted test flight now expected in 2019. While the company faces a host of challenges, "we meet or exceed all of NASA's human rating requirements with block 5 ... as well as meet all of the Air Force intel (community) requirements for extreme reliability," Musk said. "This rocket is really designed to meet that intent, to be the most reliable rocket ever built." Friday's mission got underway at 4:14 p.m. EDT (GMT-4) when the nine Merlin engines in the Falcon 9s first stage roared to life and throttled up to full thrust. After lightning-fast computer checks, the rocket was released from its firing stand and quickly climbed away atop 1.7 million pounds of thrust and a fiery jet of exhaust. Arcing away to the east through a hazy sky, the first stage powered the Falcon 9 out of the thick lower atmosphere, rapidly accelerating as it consumed its load of liquid oxygen and kerosene propellants and lost weight. The first stage engines fired for two-and-a-half minutes before shutting down. The stage then fell away and the single engine powering the Falcon 9's second stage ignited as planned to continue the boost to orbit. The first stage, meanwhile, flipped around and fell back into the atmosphere. The booster's flight computer restarted three of the stage's engines to slow down for entry before a single engine re-ignited just above the droneship. Four landing legs then unfolded and the rocket settled to a smooth touchdown on the deck of the whimsically named "Of Course I Still Love You." Touchdown came about 10 seconds before the second stage ended the first of two planned firings, putting the vehicle in a preliminary orbit. A second burn was expected about a half-hour after launch to complete the job before releasing Bangladesh's first communications satellite -- Bangabandhu 1 -- into an elliptical orbit with a predicted high point of 22,186 miles and a low point of just 196 miles. The satellite's on-board thrusters will be used to circularize the orbit at an altitude of 22,300 miles above the equator in sight of Bangladesh where the relay station will take 24 hours to complete one orbit and thus appear stationary in the sky. Built by Thales Alenia Space in France, Bangabandhu1 will provide Ku-band and C-band television and data services across Bangladesh and surrounding regions. After tests and checkout by Thales engineers, the satellite will be turned over to the Bangladesh Telecommunication Regulatory Commission for normal operations. A Thales official told Spaceflight Now the mission was valued at $245 million, including the cost of the satellite, the Falcon 9 and ground station infrastructure. Including February's maiden flight of SpaceX's three-core Falcon Heavy, Friday's launch marked the 55th flight for the Falcon 9 family of rockets, the ninth so far this year and the first for the block 5 version of the booster. SpaceX holds a $2.6 billion NASA contract to build and launch a piloted version of the company's Dragon spacecraft to ferry astronauts to and from the space station. Boeing holds a $4.2 billion contract to provide similar crew ferry services with its CST-100 spacecraft. Both companies plan unpiloted test flights later this year, following by the first piloted test flights late this year or early next. Boeing plans to launch the CST-100 atop United Launch Alliance Atlas 5 rockets while SpaceX will use the block 5 Falcon 9 for its crewed Dragon. Many of the block 5's upgrades are required by NASA before the agency will permit astronauts to take off aboard the crewed Dragon. Those and other improvements also will streamline launch processing. One of the most significant changes is the use of tougher high-pressure helium tanks, known as composite overwrapped pressure vessels, or COPVs, that are submerged in the rocket's first and second stage liquid oxygen and kerosene propellant tanks. The helium is used to pressurize the propellants and provide the muscle needed for steering. A second stage COPV apparently ruptured during a pre-launch test Sept. 1, 2016, triggering a catastrophic oxygen tank explosion five minutes before a planned engine test firing that destroyed the rocket and its satellite payload and heavily damaged launch complex 40. The new tanks, which Musk said are the most advanced pressure vessels ever built, are designed to eliminate that failure mode and are required for NASA's commercial crew program. But with memories of the spectacular explosion still fresh, SpaceX's plan to load astronauts aboard the Dragon before the rocket is fueled for flight less than an hour before liftoff, a strategy known as "load and go," has drawn sharp criticism from many NASA insiders, who have long favored loading propellants and letting those systems stabilize before putting a crew aboard. Musk downplayed those concerns Thursday, saying "that issue is somewhat overblown." "It's not a fundamental risk," he said. "The top engineering minds at SpaceX have agonized over this, we've tested the daylights out of it, we've been in deep, deep discussions with NASA about this, and I think we're in a good situation." Even so, if NASA managers cannot get comfortable with the new COPVs, Musk said "we can adjust our operational procedures to load propellants before the astronauts board. But I really think this is an overblown issue." Other block 5 changes include improved heat shield insulation at the top and bottom of the first stage to help with re-entry heating, a tougher "octaweb" first stage engine mounting framework and redesigned turbopump machinery to minimize or eliminate small cracks in critical components. The thrust of the Merlin engines has been increased to 190,000 pounds of push. Even the first stage landing legs have been redesigned to allow engineers to retract them after touchdown. The legs had to be removed in previous versions of the rocket before a recovered booster could be hauled away for post-flight processing. "Block 5 basically summarizes all that we learned on reusability," Hans Koenigsmann, a senior SpaceX manager, told reporters before a launch last month. "We tried to summarize all of these lessons learned into a booster that then is able to fly and be recovered and fly again multiple times without a lot of refurbishment. That's basically the key thing on block 5."